How can I change the widget location? The widget is placed automatically after installation in a safe location, at the bottom of your shopping cart form. The automatic placement algorithm supports most free themes and some paid themes and it is capable of selecting an adequate position to make the widget relevant to your visitors. Once there, you can add the CSS to the elements where you want it to be placed for desktop and mobile devices. 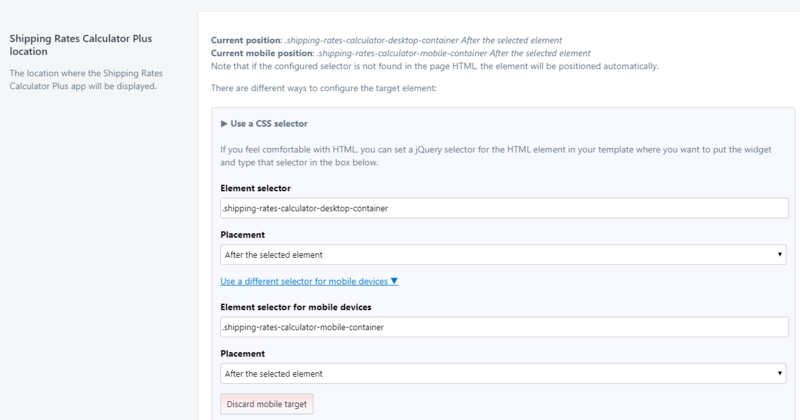 If you are comfortable with HTML, you can set a jQuery selector for the HTML element in your template where you want to put the widget and type that selector accordingly in each box. Once everything is configured as you want, please click on save on the top or bottom right corner and you'll be all set. If you want to place the widget on its original location, just add the CSS class shipping-rates-calculator-desktop-container and shipping-rates-calculator-mobile-container to the selector fields accordingly for desktop and mobile. On placement, you can select "After the selected element". Lastly, we can also help you change the location of the widget, so If you need our assistance in relocating the widget, just contact us and we will change the location for you as soon as we can.